The term rheumatoid arthritis progression requires some explanation. 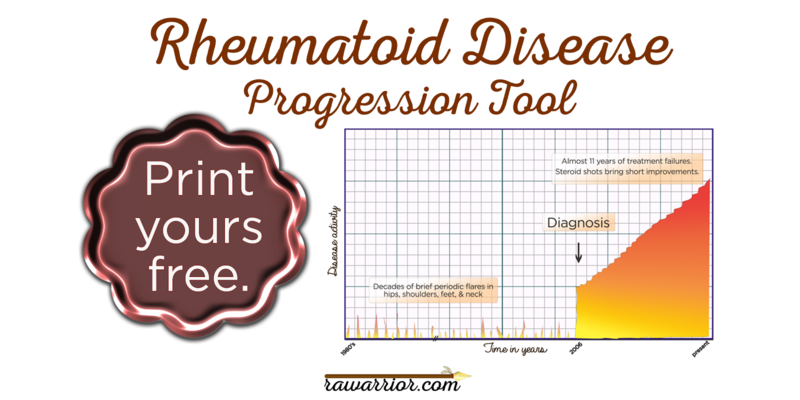 Progress is the opposite of what we observe when rheumatoid disease evolves. It is the disease that progresses, not the patient. So the advancement of the disease actually leads to the worsening of the patient’s health. 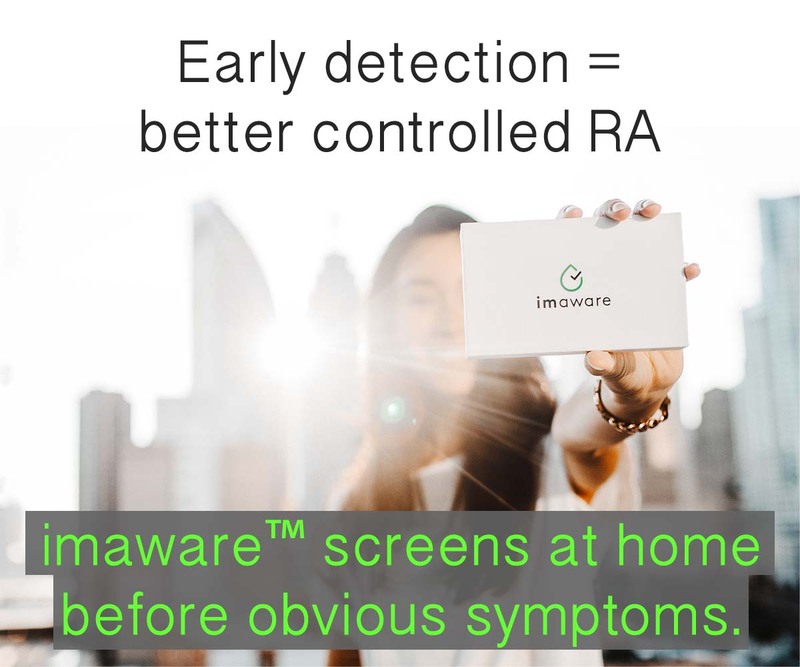 The other obvious problem with the term rheumatoid arthritis progression is that it uses the popular but inaccurate phrase “rheumatoid arthritis.” This makes it sound like the disease is a type of arthritis, when arthritis is actually only one symptom of rheumatoid disease (RD). What is Rheumatoid Arthritis progression? Vocabulary aside, what is rheumatoid arthritis progression? Rheumatoid arthritis progression describes ways that the disease develops and evolves in a particular person with rheumatoid disease (PRD). RD may progress gradually or suddenly in an individual PRD. Or it may do both things at different times in his or her life. Disease activity may be obvious or subtle. Disease progression includes both musculoskeletal related problems and other systemic disease involvement, such as cardiovascular, lung, eye, or skin issues stemming from the RD. People who are new to RD or who care about a loved one with RD usually ask: What is going to happen next? How disabled could I be? How long does that take? What about remission? I searched too. As I read books from the library and research articles online, I remember learning about common patterns in disease progression. But over the years, I’ve mostly learned from you – from actual people with rheumatoid disease (PRD). And I have become confident that RD is a very diverse disease with many distinct patterns. And, the progression of RD is not only different between PRD, it is also likely different in the same person over time. 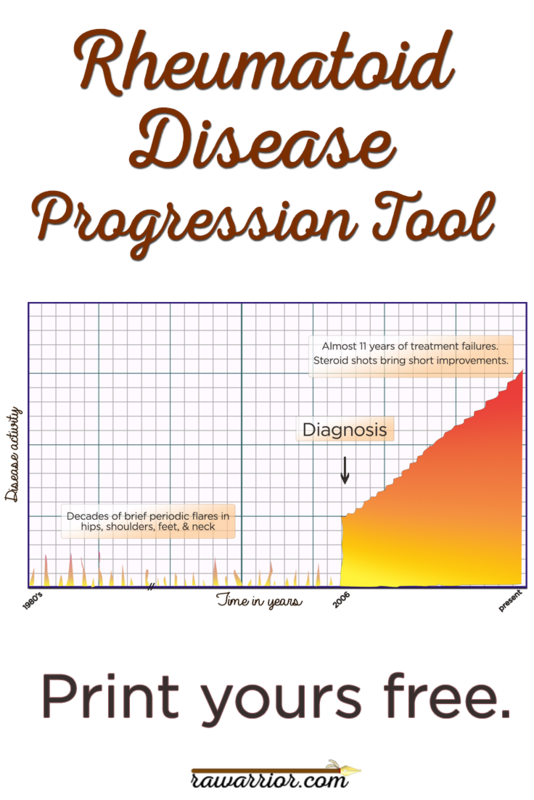 The example image on this page shows my own disease progression so far. 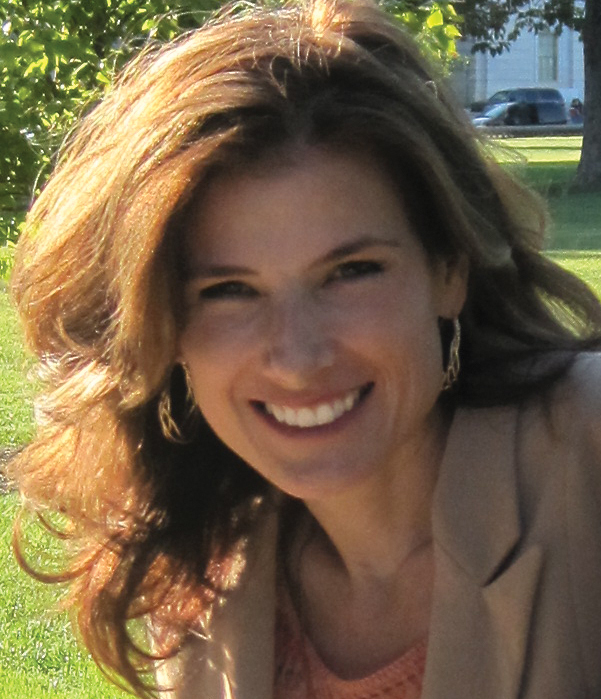 For many years, I lived with a flaring disease pattern, being absolutely fine in between times. Although I was not diagnosed during that time, the symptoms were identical to those at diagnosis. I was diagnosed after the disease spread to every joint over several months. After diagnosis, I have not experienced any flaring and remitting patterns, only constant disease activity, with changes in which joints are worse. However, the disease has very noticeably evolved over the past 11 years so I tried to include that. All of my systemic disease issues have been addressed by non-rheumatologists, but I’ve only included those that are definitely RD related. Since I have not responded to treatments other than steroids, my graph does not show a sharp drop in disease activity that other graphs might show. The image on this page is an example of a tool you can print to illustrate your own disease progression. You may freely print as many copies as you need. Click here to download the tool and read all of the instructions and helpful tips to use the tool. 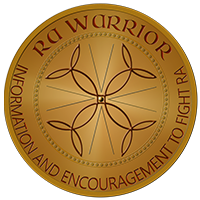 HOW HAVE YOU EXPERIENCED RHEUMATOID ARTHRITIS PROGRESSION? 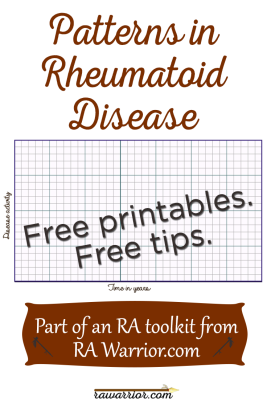 Click HERE for the free Rheumatoid Arthritis progression printable tool. Stay tuned for the next free tool. I heard about your blog on Ted Talks with E-patient Dave. I have one quick question for you. What is the nuclear bone scan website that converted your scan to inflammation markers? Interesting idea to do a lifetime chart. I might give it a run to see if it works out. I know the worst and I know now (better) so it is an interesting idea. So glad you back with us.! I missed you and was concerned for you. Since turning 65 I had to quick taking Humira (which was an ok med for me) because they won’t pay for the patient to inject self. So now I need to do infusions. I have had 3 different ones and they all affected my liver counts. But now am on rituxin which is a 6 hour long infusion. YOu take it one day wait 2 weeks and do it again. I had my infusion in November. Doctors say 4 – 6 months until next infusion. I havent had to have it yet and am actually enjoying my days with a little spring in my step. Now sometimes I do too much and am tired the next day and hurt from pushing to hard. But I am not so tired each day that I force myself to go. So so far this is good. Just had shots in my bursae on each hip 2 weeks ago and they did help. I hope your shot at least lets you have some joy in your life. I was diagnosed four years ago this January. All my joints are affected including my jaw and excepting my knees. I have a constant disease activity. My feet are the worst making it difficult to walk. My knuckles are a mess. I am on methotrexate injections, plaquenil, meloxicam, methylprednisolone. I am writing because I read your recent blog on injections. When my RDgets unbearable I use the Medrol dose pack. I use the Medrol dose pack and I feel like a new person. Wish it would last. Thank you for your blog you are an inspiration to so many.